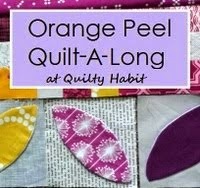 Quilty Habit: Viewer's Choice Voting: Orange Peel QAL! Such beautiful work! Congrats to everyone on a job well done! Everyone did a fabulous job! Sooooo hard to pick a favorite. Love how different all the projects are. That is one of my favorite things about quilting. Love how different each quilter's art is - so unique, just like us!!! Fabulous!!! They are all so beautiful! It is going to be hard to pick one favorite. It's nice to see such variety with one pattern! !